Still from the film, courtest of Cinema Guild. 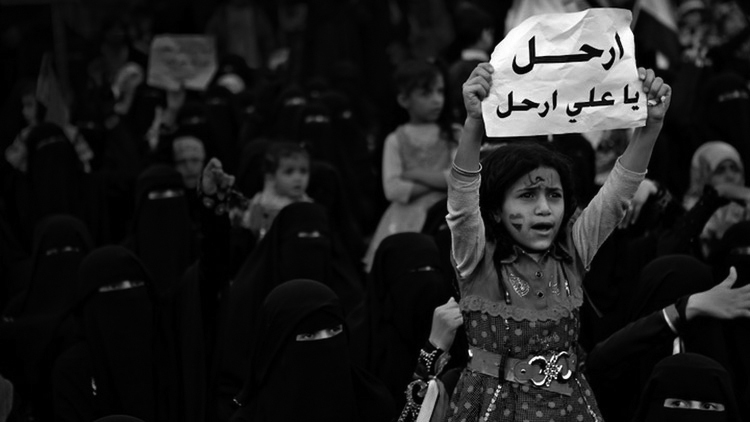 The heartbreaking film “Karama Has No Walls” recounts the 2011 protests in Yemen’s capital against the autocratic rule of former president Ali Abdullah Saleh. The film relies on extremely powerful first-hand video taken by protestors, primarily by two young cameramen, Khaled Rajeh and Nasr al-Namir, at protests referred to as “The day of Karama” or day of dignity. The short film opens with scenes of protesters gathering after Friday prayers, confronting a wall constructed by the state security forces to halt their progress. Soon, the protesters begin to light fires on the far side of the wall, while pro-regime thugs fire shots into the air to dissuade them from pushing further. They don’t relent. As they breach the barrier, the thugs confront them, opening fire. As scenes of protest turn to scenes of violence, men scramble back and forth, shuttling fallen comrades away from the melee. The film shows a protester screaming into the camera, “How could you, Ali,” calling out the president directly while clutching his blood-soaked shirt. Khaled, one of the cameramen, can be heard reciting the shahada as he pushes further into the breach. As he narrates the events, Khaled tells us that he is certain that he will die that day. Interviews revealing the story of two young Yemenis, Anwar and Saleem. Anwar’s father, frame the film. From the outset, they show the viewer that Anwar truly believes in the cause. Anwar’s father recounts his son asking, “If you convince me not to go, who will carry on the revolution?” As events unfold, we discover that the son has fallen victim to the violence, and numbers among the dead on that day. Saleem, the other, much younger boy featured in the film – a virtual child – lives, but a bullet takes both of his eyes, leaving him blind. His family’s pain is palpably shown in intimate interviews. The film ends with the fate of the two camera men, Khaled and Nasr. “Karama” stood against the Saleh regime and continues to struggle for freedom and justice in the ongoing civil war that has engulfed the country since the initial 2011 protests. This short, but important document also demonstrates the atrocities committed by an autocratic regime – atrocities that have gone largely unnoticed in the West. This article appeared in Al Jadid Magazine, Vol. 19, No. 69, 2015.